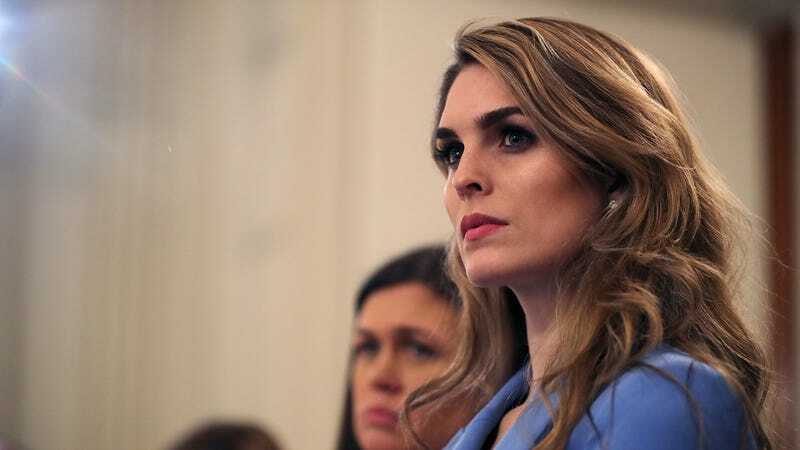 Hope Hicks, the former White House Communications Director who was best known for being extremely quiet and reluctant to speak to members of the press (which some might call not doing her job), dating a fellow White House staffer who resigned after the emergence of allegations of domestic abuse, and testifying before the House Intelligence Committee that she occasionally told white lies on behalf of her boss but never ever about Russia, is...maybe coming back? As Politico reported, last weekend, after hanging out with her buddies Jared Kushner and Ivanka Trump, Hicks joined the president and his staffers on their trip to Ohio for a Trump rally. After announcing she would step down from her post in February and formally leaving the White House in March, Hicks decamped from Washington DC to New York City, where she settled into the Upper East Side, contemplating life as a private citizen and meeting with potential employers from Ralph Lauren to Goldman Sachs. These are not life choices I would personally make, but compared to having to manage the rants and ravings of your unhinged boss on a daily basis, okay, Hope, I get it! But according to Politico, Hicks, who declined to comment, “misses the buzz of the White House and the camaraderie of Trump’s inner circle,” and she’s ready to return to the ongoing horror show that is the Trump universe. Is she possibly suffering from a severe case of Stockholm Syndrome? Does she just want the contact high that comes from proximity to power? Hope, I suspect, will probably never tell.